This is a primer on how to cook artichokes - if you're going to invest the time into cooking artichokes, you want them to be fantastic. Spring is the time I tend to cook them once or twice a week. And, although the process takes time and attention, I can't help myself. When artichokes are good, there are few things I'd rather be eating. Straight up, I think a lot of people are intimidated by the idea of cooking artichokes, or they think it's not worth the effort. My friends confirm this. 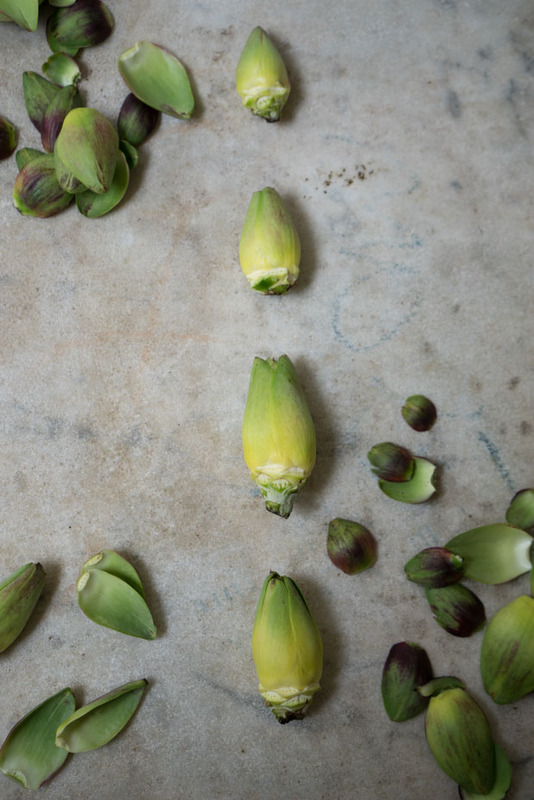 The topic has come up a few times lately, and the conversations are typically punctuated by a confession that they never cook artichokes at home. So(!) I thought I'd do a quick outline of how I handle these armored spring ambassadors. Eight times out of ten I use the cooking method I'm going to outlined in the recipe sectin below. 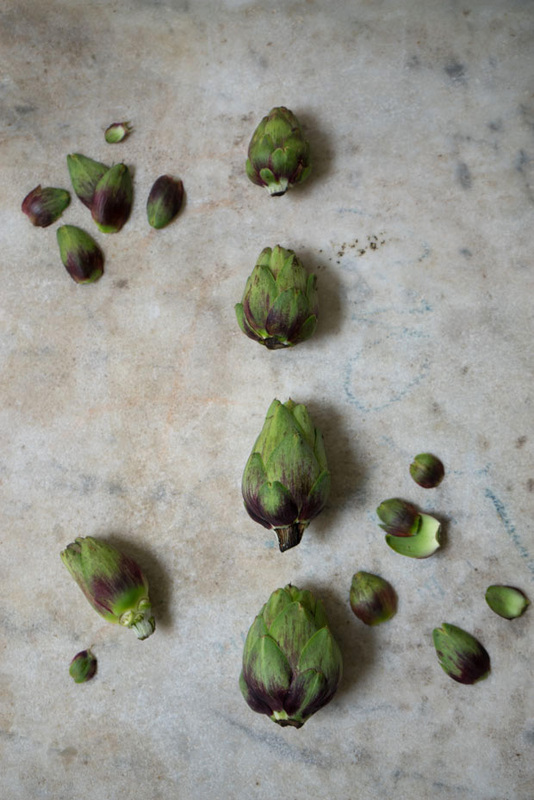 It requires nothing more than good (baby) artichokes, olive oil or clarified butter, and sea salt. If you can pair those ingredients, with a bit of practice, a hint of patience, and a window of time, you can absolutely cook some of the best artichokes. Not kidding. Once you hit your groove with these wondrous thistles, few of you will look back. Nutritionists celebrate artichokes for a long list of reasons. They're packed with fiber, antioxidants, and phytonutrients, and have long been known to support the liver. They don't get as much of the limelight as other ingredients - for example pomegranate, turmeric, acai, etc. - but they bring quite a lot to the table. It's worth incorporating them into your meals, particularly when they're in season. Update: I recently discovered frozen bags of artichokes at a local Trader Joes, and started experimenting to see if using them would be a worthwhile substitute to using fresh artichokes. 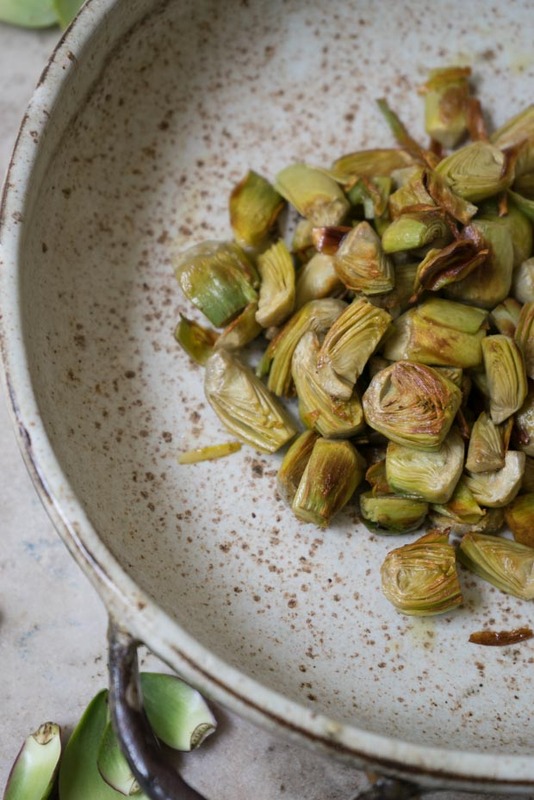 At the very least, this could be a way to extend artichoke season. I don't love canned or jarred artichokes, and it turns out, the frozen option is pretty great. You can cook them in a covered skillet in a bit of olive oil, straight from the freezer, until they're cooked through, and then remove the cover and dial up the heat to get some nice, golden color on them. Season and serve. So good! More times that not, this is how I like to prepare artichokes. The method works for whatever artichokes look good at the market - baby artichokes are ideal. The gist is - trim, blanch, saute. You end up with beautiful, tender, succulent, golden-crusted artichoke hearts that can be enjoyed straight from the pan, or in any number of other preparations - I outline a few below. Fill a bowl with water, squeeze the juice of the lemon into it. You'll add the artichokes to the water immediately after trimming. To trim your artichokes: Actually, before I get into the details of trimming, let's just establish what we're after. We're after the tender. Meaning, we want to trim any tough outer leaves, tips, and stem. We want to get down to the tender parts of the leaves, without trimming so much that we have little left. To start, trim the stem. Pull the outer leaves from the artichoke, until you get down to the more tender leaves. Cut off the top of the artichoke (roughly where it begins to taper in), you want to remove the tough part of the tips. I like to use a serrated knife for that cut. From here decide what shape you'd like your artichoke pieces to be. For this preparation, I cut each artichoke in halves, and/or quarters. If you are using larger artichokes, ones that have developed a fuzzy choke, you'll need to use a teaspoon (or mellon baller) to carve the fuzz out before moving on to your final cuts. 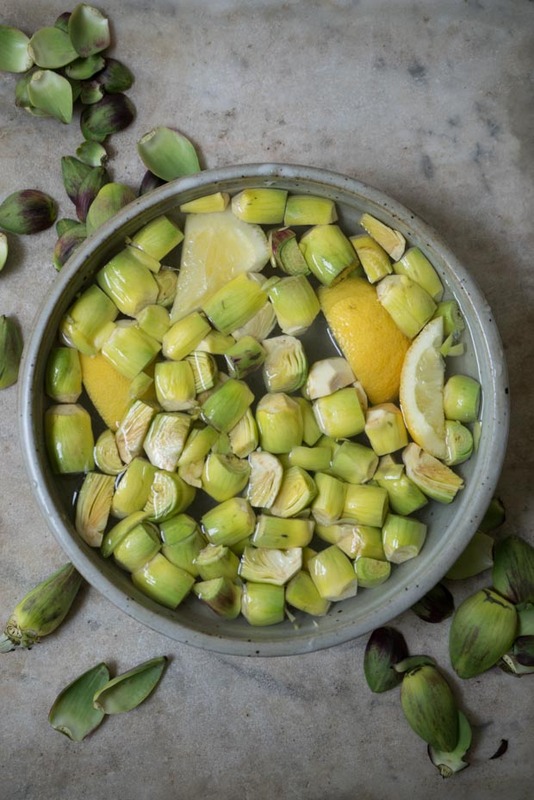 Work efficiently, and get the trimmed artichokes in the lemon water as quickly as possible to reduce browning from oxidation. While prepping the artichokes, bring a medium saucepan of water to a boil. Salt well, and use a slotted spoon to transfer them from the lemon water to the boiling water. Boil until just tender, typically a minute or two. Drain well, and set aside. Alternately, you can steam the artichokes - this will keep more of the nutrients intact. Either way, you want the artichokes to be cooked tender (and feel free to eat them at this point)! Heat a tablespoon of oil or clarified butter in a large saucepan over medium high heat. When hot, transfer the artichokes to the pan in a single layer. Toss to coat, and add a pinch or two of salt. 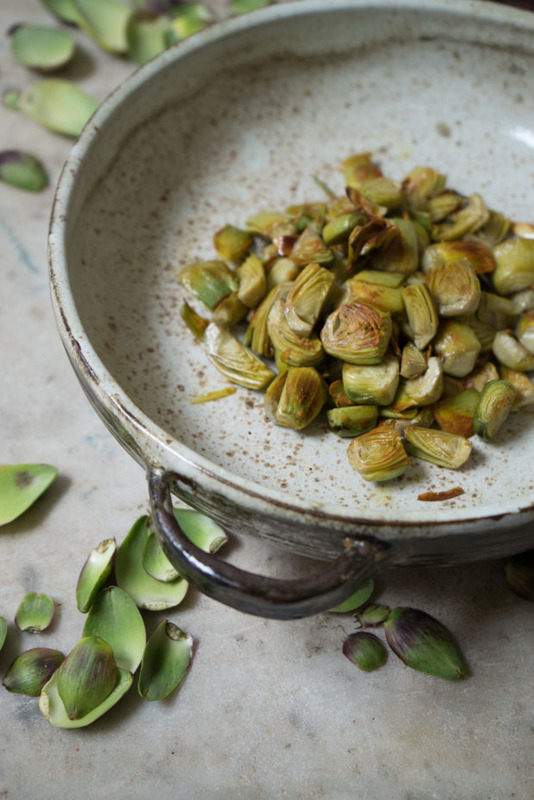 Allow to saute, tossing every few minutes, until the artichokes are deeply golden and crusted. Buying Artichokes: Your success here is going to depend on sourcing good artichokes. Look for tight, dense examples. This is a sign that they have been recently harvested. If you see the leaves have started to flower out, separate, or dry out, give them a pass. Storage: Store artichokes in a bag in your refrigerator until ready to use. That said, try to use them quickly - within few days of purchase. The sooner the better. Add-ins: This technique makes beautiful artichokes in their own right, but occasionally I like to flare them out with other things I have on hand. they have a great affinity for olives, orange zest, chopped almonds, chile flakes, fennel, anise, and lemon oil. Great-on: Once you have a skillet of these, you can eat them on their own, or use them in/on all sorts of things. This artichoke season I've had them on farro risotto, quinoa, frittata, pureed cauliflower soup, and chopped into a ravioli filling. As I'm typing this, I'm imagining they'd be amazing as a component in a dumpling filling, or spring roll. Asparagus is the workhorse of the springtime kitchen. Here are a handful of asparagus winners that will teach you how to cook asparagus like a pro!